How time flies! I took these images last Thursday night and intended to post them shortly afterwards. Obviously I got sidetracked, but now I am finally releasing them to the world. In 1915, San Francisco hosted the Panama-Pacific International Exposition (PPIE) which primary purpose was to celebrate the opening of the Panama Canal. But at the same time, it showcased the recovery of the city after the devastating 1906 earthquake. This year marks the world’s fair’s 100th anniversary. 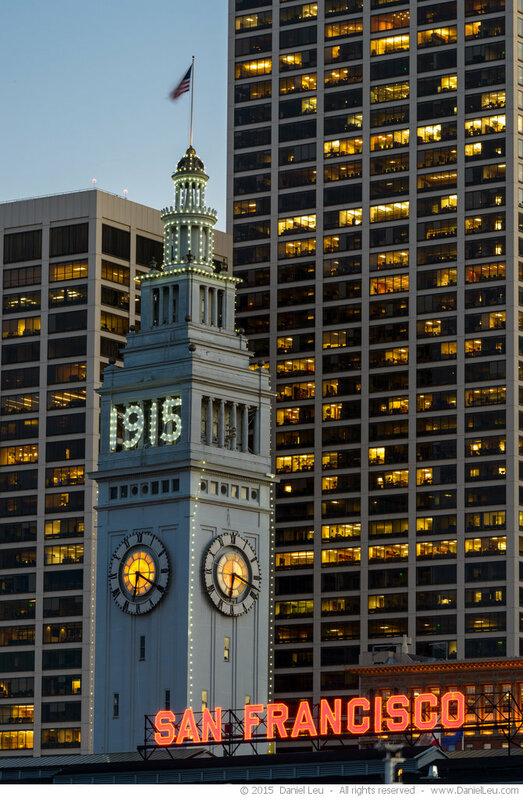 To celebrate this event, the Ferry Building is adored with additional lights that replicate its 1915’s look. These lights were turned on last Thursday and will remain there until December 4th which coincidence with the 100th anniversary of the end of the world’s fair. 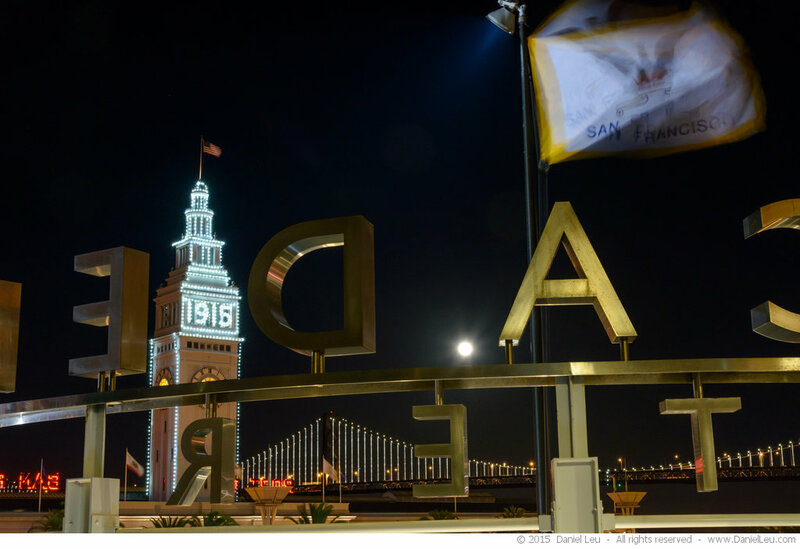 While the 1915′ s lights are the new attraction, The Bay Lights were turned off last Friday. 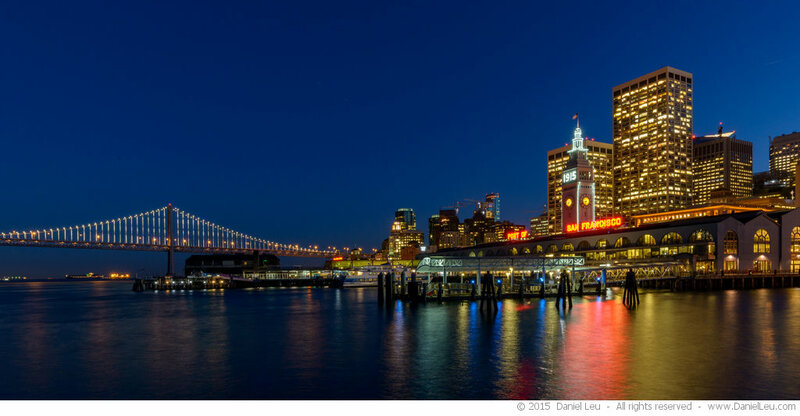 No worries, The Bay Lights will come back in 2016 as a version 2 incarnation after Caltrans performs maintenance on the bridge. But this meant that there was very little time to capture the two lit structures together. The next image was created from a sequence of 9 images resulting in 28,000 x 7,000. Printed at 300dpi, this would result in a print that is more than 10ft wide and about 2ft high. The full moon just crossed the deck of the Bay Bridge. My main objective for the night was to capture a scene with the new Ferry Building lights, the Bay Bridge with The Bay Lights and the rising full moon. Without having access to an apartment in one of the high-rises, my options were limited. But I found a spot where I could have them in one shot. Even the wind played its part so that the flag on top of the tower is nicely in view. This next image is a bit busy, but I really like the bold letters of the Embarcadero Center and the San Francisco flag in the foreground. It took me a few trials to get the flag in the open shape as the wind wasn’t playing nicely anymore. Prints and Licensing: All images are available as fine art prints and for licensing. Please contact me for more details. 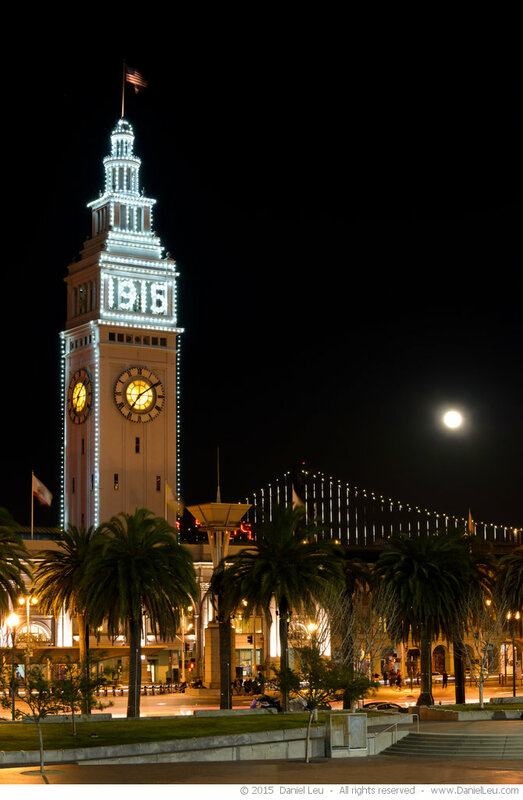 I’m the woman who was “shooting” the scene of the full moon over the Ferry Building with her little pink Canon camera. I didn’t get QUITE the clarity you did!! I love your shot, and hope to see more of your photography, so please put me on an email list to let me know where and when you will have a showing.